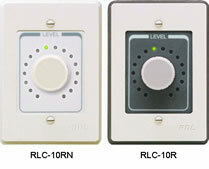 APPLICATION: The RLC-10R is the ideal choice for 0 to 10 Vdc or pulsed control from a remote location. Circuitry is based on optical encoder technology to produce long-term, trouble-free operation. Control is incremented up or down when the large front-panel knob is rotated. Acceleration is provided so the rate of change is faster when the knob is rotated more rapidly, yielding a responsive feel. The LED ring display encircling the control knob operates as a virtual pointer. The input to this display is a 0 to 10 Vdc signal, either internal or external. A 0 to 10 Vdc output provides single point control for RDL VCA products and other industry 0 to 10 Vdc controlled equipment. 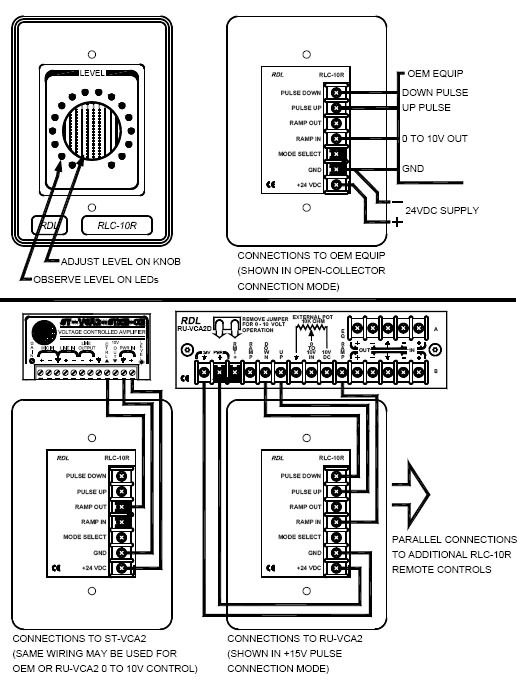 If multiple control points are desired, individual up or down pulse outputs may be connected to RDL RU-VCA products and various industry products. A rear-panel jumper sets the pulse outputs to either produce +15 Vdc pulses (RDL RU-VCA) or momentary open-collector pulses. In the event of power loss, internal non-volatile memory stores the last level value. When power returns, the 0 to 10 V output will return to the operating level present when power was lost.